Line a 9×13 inch pan with parchment paper and spray with non-stick cooking spray. Combine flours, xanthan gum, and baking powder in a medium bowl. Mix well to combine. In large microwave safe bowl, melt coconut oil, adding in cocoa and sugar and mix well to combine. Stir in applesauce and vanilla essence. Blend in dry ingredients until incorporated. Pour into prepared pan and spread to edges of pan. Bake 30-35 minutes or until toothpick comes out clean. Cool completely. 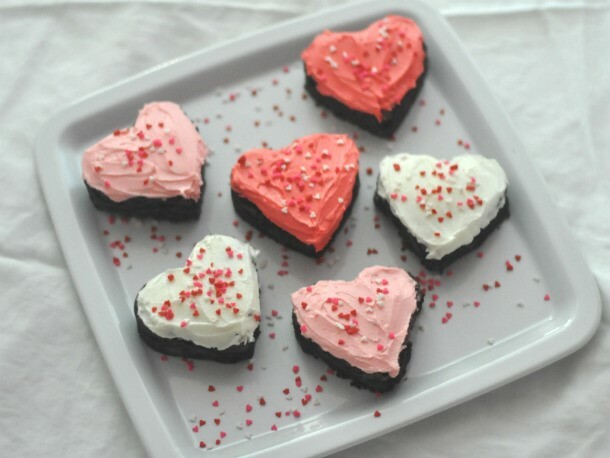 Cut into squares or using metal heart-shaped cookie cutter. Beat together the vegan margarine with 1 tbsp of warm water, vanilla essence until smooth and creamy and then add the sugar beating on a medium setting. Extra warm water (1-2 more tablespoons) may be required to think the icing mixture. Add red food colouring and sprinkles to decorate. * While margarine is not dairy-based, many types contain trace amounts of animal products, usually in the form of whey or lactose. If you have a dairy allergy or are a strict vegan, you will want to use only those types of margarine that are free of even small amounts of dairy. In contrast, butter is always a dairy product made from cow milk.